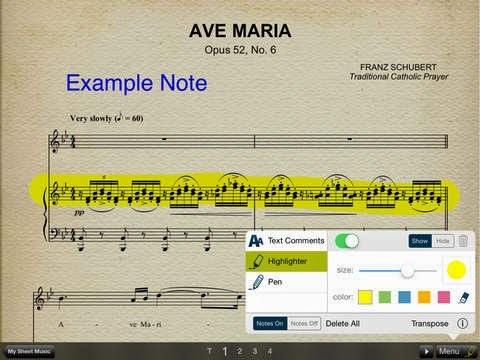 The free Musicnotes app is first and foremost a frontend and viewer for the Musicnotes.com sheet music store. The Musicnotes.com sheet music store contains almost 300000 arrangements in all styles from classical to pop for singers, choir, pianists, strings, brass -- you name it. All legal and licensed and, as far as I can tell, with good quality transcriptions. Prices vary, but most popular downloads seems to be around $5. But, if you want to add other songs to your Musicnotes app's music library, the in-app-purchase for PDF support is $17. Even then the PDF files can only be imported through iTunes on a connected computer. But what's worse, the app is quite buggy (especially the search function) and navigation can be frustrating at times. Basic tasks like setting up and using playlists, adding and annotating songs etc are a lot more complicated than they should be. The experience gets even more confusing after (inadvertently) tapping a "play" icon, which opens the song in another app (Musicnotes Player) which actually looks a lot nicer. Unfortunately the Player app doesn't do PDF or any other common format, and strangely enough can't sync song lists or even annotations between the apps. In this case the sum is far less than the parts. The Android version of Musicnotes also lacks PDF support and adds severe instability to the list of problems. The app crashes so often that it is unusable for practicing. And don't even think about gigging with the current version. Maybe you can tell by now, but I'm not that fond of this app. Even if it is "free", it should really be avoided. If you need songs from Musicnotes.com, a better option is to buy and print them to PDF from a web browser. Then import the PDF to something more reliable, e.g. the Fakebook app. This will save you a lot of trouble, trust me! You just gotta love an application with a transmogrify button. Odd user interface and odd update policy -- too bad for an otherwise good app. Excellent for private practice, but depending on your needs it might not be the right choice for your gigs. On iOS the forScore app is the score app, by many considered the golden standard. And for good reason. For an app like this the giggability rules. And the iGigBook is great at the gig! Perfect for getting started with PDF sheet music. Avoid if you need flexibility. The most compatible music reader app - as long as you only need ChordPro. This site grew out of the work with the popular Music Reader Jungle comparison chart. While useful for a quick look-up, the format didn't allow for any analysis of pros and cons. The hard working developers behind the apps deserves more. So, while I'm obviously biased and cannot promise to be completely objective, I will try to be fair and always give developers due respect. Think otherwise? Please comment the posts!